PRICE INCLUDES: Round-trip Airfare and 7 Nights Lodging Breakfast Daily! Ireland flights are non-stop to Dublin (from Chicago). All tours are subject to change based on vacancy. All prices are subject to change based on airfare increases beyond our control. Non refundable deposit of $1000 is required at the time of reservation, and your ticket(s) will be purchased immediately. Be advised that once your airline ticket is purchased it is non-refundable and non-transferable. In addition, any cancellation within 90 days of departure will result in total forfeiture of payment to Harp and Eagle Tours. We highly recommend travel insurance through travelguard.com. Prices listed are per person, based on double occupancy. Single traveler rates increase by approximately $300. Prices subject to change without notice until the deposit is received and airline tickets are purchased. Our Responsibility: We accept responsibility for ensuring that all elements of your tour are as described in this website and are of a reasonable standard. We will notify you of any changes prior to your travel date, unless circumstances are beyond our control. We can accept no responsibility for losses or additional expenses due to any delay or cause beyond our control. All such losses will be borne by the traveler. We disclaim any responsibility or liability whatsoever for loss, damage, injury, illness, or expense to person or property due to any cause whatsoever occurring during the tour or otherwise. Taxes are subject to change. All travelers must present a valid passport with names that match the spelling on the airline booking confirmation. Travel insurance is recommended. The rate schedule is approximate until your ticket[s] is [are] purchased. Please check this box if you have read and understand our tour policy. I / We plan to use the airport shuttle in Ireland. I / We plan to participate in some of the Daily Tours. To complete your registration, please call Mandy at (920) 362-6393 with your payment details. Your reservation will not be held, and your airline tickets will not be purchased until your payment is secured by calling Mandy at (920) 362-6393 with your payment details. It is recommended to arrive at O’Hare Airport 3 hours early to check in luggage, customs, etc. All passengers must be at O’Hare’s International Terminal No. 5 at least 2.5 hours before departure. We do not provide shuttle service, but recommend coachusa.com. 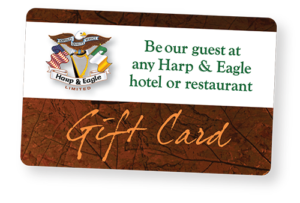 Ticket confirmation will be mailed directly to you by Harp & Eagle Tours approximately four weeks before departure. Pre-assigned seats can be arranged directly through the Airline. You must have your confirmation number in order to check in. Actual tickets are not provided. Each room is pre-assigned to the guest by the Old Ground Hotel before arrival. The rooms may be different in size offering different views. A variety of car rental options are available at the airport. Driving in Ireland/Scotland is on the left side of the road and requires a valid US driver’s license, passport and credit card. Please note a shuttle bus ride to and from Dublin airport to Ennis is available for around €30, one way, paid by credit card. We look forward to your stay in Ennis, Ireland! Download and print our Tour Pricing and Registration Brochure (pdf).